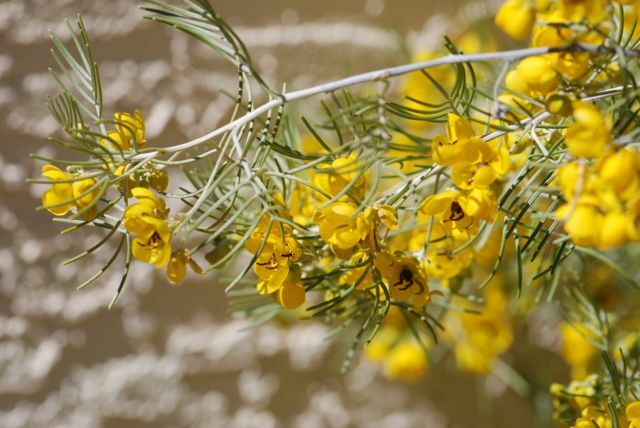 The mystery seeds were from the silver or feathery senna, Senna artemisioides. You might know it under another name. It used to belong to the genus Cassia and so it often goes by its old names, silver of feathery cassia. The silver or feathery part of the name comes from the silvery, lacy leaves. 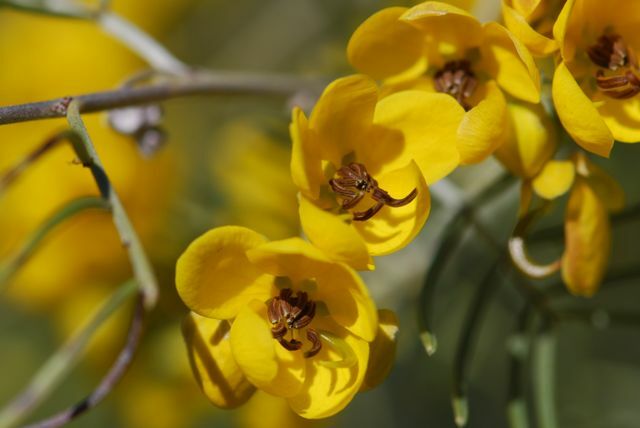 Sennas are endemic to arid regions of Australia (Australian Native Plant Society), but they are used as landscape plants around the world. 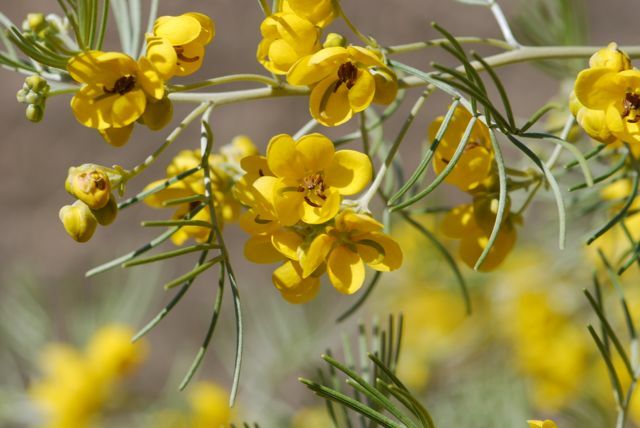 Silver sennas are some of the first plants to bloom in the spring here in the Southwestern United States. 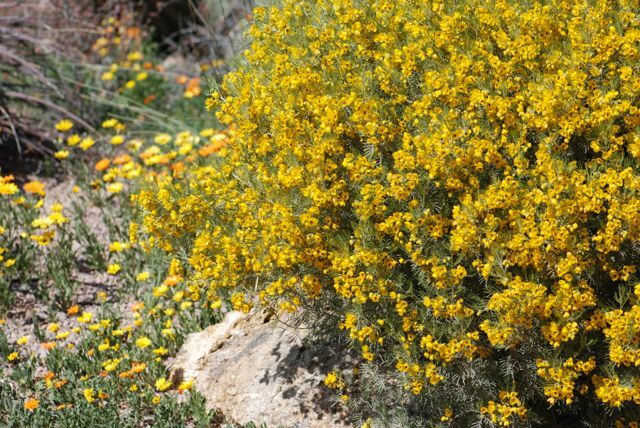 They have cheerful bright yellow blossoms and a distinctive odor. 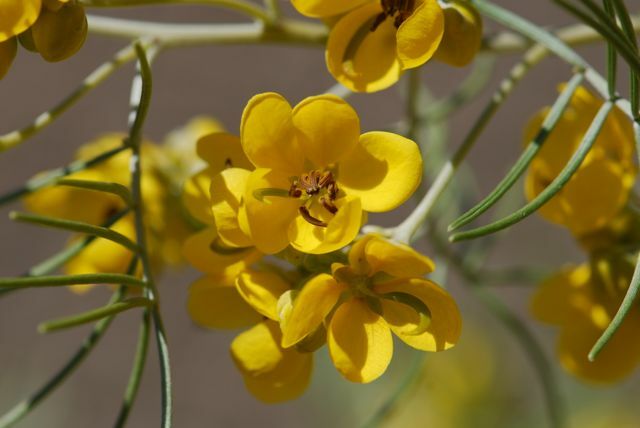 Looking closely at the flowers, it becomes apparent that they have an unusual structure. The female part of the flower (carpel) is the light green part that curves off to the side from the center of the flower. The bottom flower in this photograph has lost the stamens (brown structures that are the male part of the flower), so you can see the hooked, bean-like female structure clearly. Flowers with an asymmetric structure like this are somewhat unusual and it has to do with how they are pollinated. In Australia they are buzz pollinated, which means that bees clasp onto the stamens and vibrate them by buzzing to release the pollen. The female part stays off to the side and away from the action so to speak. 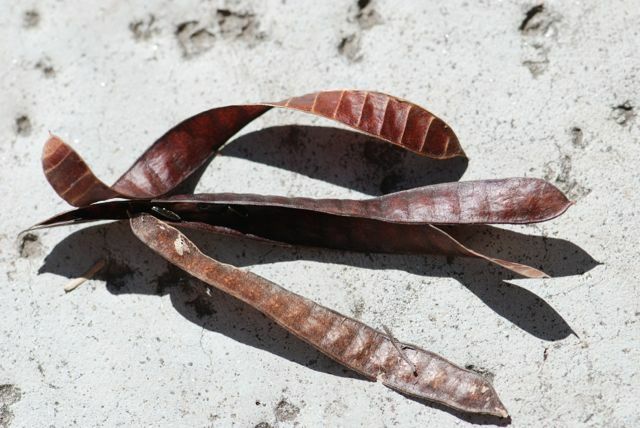 The female parts eventually mature into these pods that contain rows of black seeds. In our yard at least, the seeds germinate readily and we could soon have a sea of sennas if we didn't regularly weed them out. Do sennas grow where you live? Have you ever looked closely at the flowers?